Perfect if you're looking to spend your days carving some wakes and pumping adrenaline, this model includes a retractable ski pylon with a high tow point that keeps the rope out of the water, our exclusive Ski mode, and a removable board rack. -1,494 cc four-stroke, Rotax with three cylinders in-line and four valves per cylinder: The most powerful, naturally aspirated Rotax engine on a Sea-Doo offers instant acceleration for instant fun. Tested and proven to be incredibly reliable and fuel-efficient for more than a decade. -iTC (Intelligent Throttle Control) system: Operating electronically, this advanced throttle system starts you in neutral for easier dockside starts. It also features activity-specific Touring, Sport and ECO modes that can all be set to accommodate your riding style. The result is a more responsive, more intuitive ride. -iControl Learning Key: The programmable Learning Key allows you to limit the performance of the PWC based on rider skill-level. 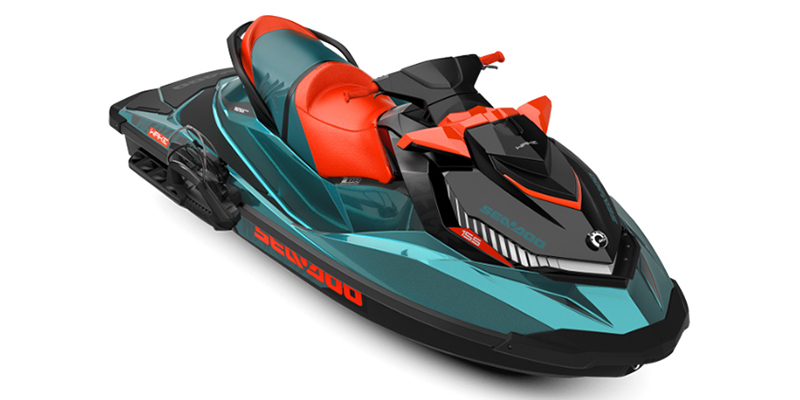 -D-Sea-Bel system: Combines a series of resonators and vibration-absorbing components to make Sea-Doo watercraft some of the quietest on the water. -Polytec: The hull is made of Polytec material, a recyclable, low density and high-impact composite material that includes polypropylene and long glass fiber reinforcements. It was designed to maintain the structural integrity of the watercraft under stress while providing light yet durable parts to support the construction of the product. -iControl: The "Brain" that integrates and controls all systems to create the best possible ride. -ECO Mode: This iTC function automatically determines the most economical power delivery and sets the optimal RPM for greatest fuel economy. -3-UP Seat: Comfortable room for three - permits rear-facing spotter for watersports. -Elevated Fuel Filler: Easy access and prevents water intrusion while refueling. -Reboarding Ladder: Makes reboarding from the water easier and quicker. -RF D.E.S.S. Key: With radio frequency technology and a ball-andsocket design, the Digitally Encoded Security System (D.E.S.S.) key provides riders with easy and quick starts every time. -Interactive Multifunction Digital Information Center: Cruise control, Slow mode, VTS, Fuel consumption instant & average, Fuel level, Tachometer, Speedometer, Hour meter, Compass, Clock, Touring mode, Sport mode, ECO mode, F-N-R indicator and more. -iBR (Intelligent Brake & Reverse) system: First and only true brake on a watercraft recognized by the U.S. Coast Guard for improving boating safety since 2009. Now in its 3rd generation, the intuitive and improved iBR(r) allows you to stop close to 160 feet sooner for greater peace of mind. All with the squeeze of a lever. And with its electronic reverse, it gives you a level of maneuverability that makes docking easier. -Speed-Based Ski Mode: This advanced iControl(r) feature allows the driver to adjust the intensity of the launch for different rider skill levels and tow sports while maintaining a constant speed. You get 5 acceleration profiles for the best possible tow sports experience. -3-Position Retractable Ski Pylon: Enjoy a higher tow point thanks to the retractable ski pylon that stows away when not in use. Features spotter handgrips and rope storage. -Removable Wakeboard Rack: Provides easy transport of a wakeboard to the ride site. -Variable Trim System (VTS): The VTS adjusts the angle of the nozzle to change the behavior of the watercraft and improve parallelism to the water.